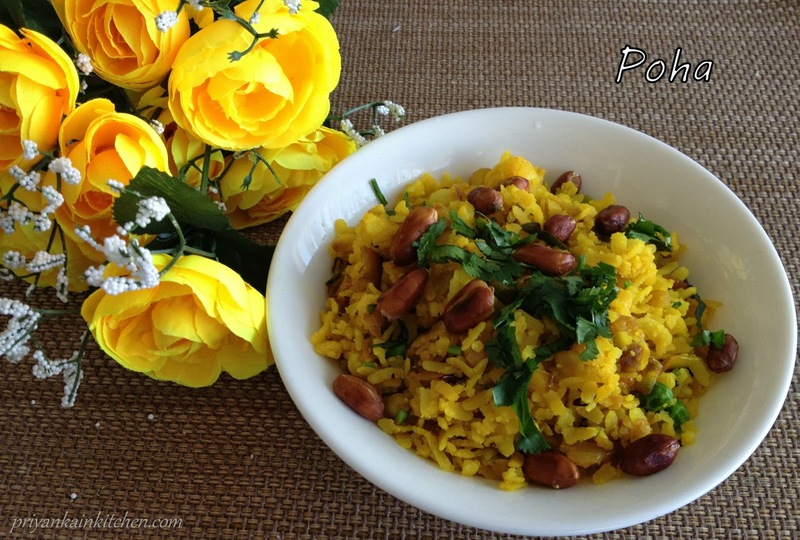 Poha is one of those very famous Indian dishes that has made a place for itself in almost every Indian household. Being very light, high in iron, quick and tasty, it becomes a staple in every family very soon. 1 medium sized potato boiled and then diced. Take poha in a big bowl and soak it in water for just 2 mins. Now drain the water and keep it in sieve/ colander to swell and become soft. Add 1 tsp of oil in a kadai/ wok and put on heat. Add peanuts and roast them stirring continuously. Peanuts tend to make crackling sound when roasted. When the sound is reduced and they turn color, take them out in a bowl and keep aside. Now add 1 or 2 tbsp oil in the wok. When hot add mustard seeds and curry leaves. Let them crackle. Now add onions and green chilies. Stir fry until onions turn translucent. Now reduce the heat, add turmeric powder and chili powder. Mix well. Add potatoes and green peas. Mix well. Add salt according to potatoes and peas. Cover and let it cook until peas turn soft. Now add soaked poha, salt, lemon and sugar. Mix well. Cover for another 2 mins. Serve garnished with chopped cilantro and roasted peanuts. Tip: If you are using thick poha, then soak it in water for 5-7 mins before draining in colander. Still if it appears dry, you can add 1/4 cup of water to it while cooking in step 8.